CHATTANOOGA,Tenn. 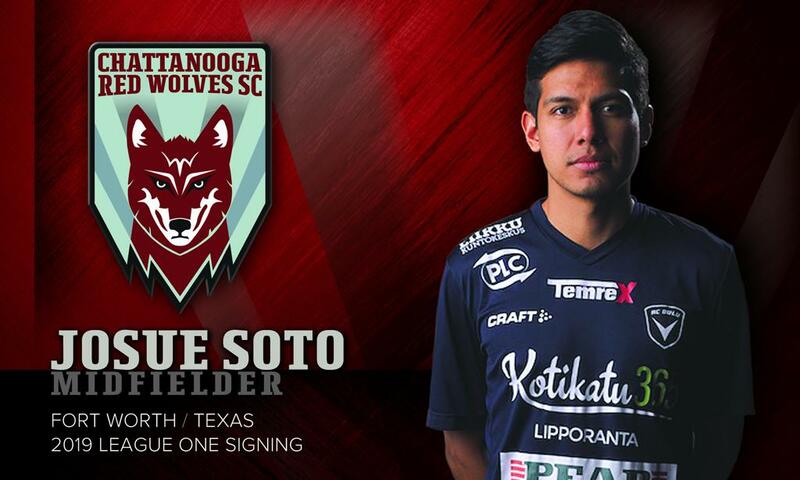 (Nov. 30, 2018) – Chattanooga Red Wolves SC has signed midfielder Josue Soto to its USL League One team. Soto will join the franchise for its inaugural season in 2019 from Finland’s AC Oulu, pending league and federation approval. Spending the past two seasons with AC Oulu of Ykkönen, the second highest Finnish league, Soto made 36 appearances with a combined nearly 1,800 minutes played. Most recently, the midfielder finished the 2018 season with two goals and four assists in all competitions. According to Tim Hankinson, head coach and technical director for Chattanooga Red Wolves SC, Soto makes both a familiar and impressive addition to the Red Wolves roster. Prior to joining Oulu, Soto began his professional career with Houston Dynamo of the MLS as the club’s third homegrown contract in 2011, making appearances in friendlies and reserve matches, before eventually being loaned to the NASL San Antonio Scorpions in 2012. From there, Soto held a stint with Chivas USA during the 2013-14 season. In 2014, Soto returned to the Scorpions, where he made 26 appearances and led his team to win the NASL Soccer Bowl. In 2015, he stayed on for another season with the Scorpions before venturing overseas to join FF Jaro in Finland’s Ykkönen for the 2016 season. As a college player, Soto played for Carolina Dynamo in USL Premier Development League, now officially known as USL League Two. He clocks in as the seventh player signee for the club as it continues to build out its roster. Other signees include Greg Hartley, Éamon Zayed and Steven Beattie.